This package deal was put together based on the input of many industry professionals, law enforcement and military individuals. This kit takes your basic AR-15 and gives you the essentials for a home or personal defense rifle. Every serious use rifle should have a quality light and a 2-point sling. This package includes everything you need to get up and running and is easily installed with an Allen wrench and screwdriver. 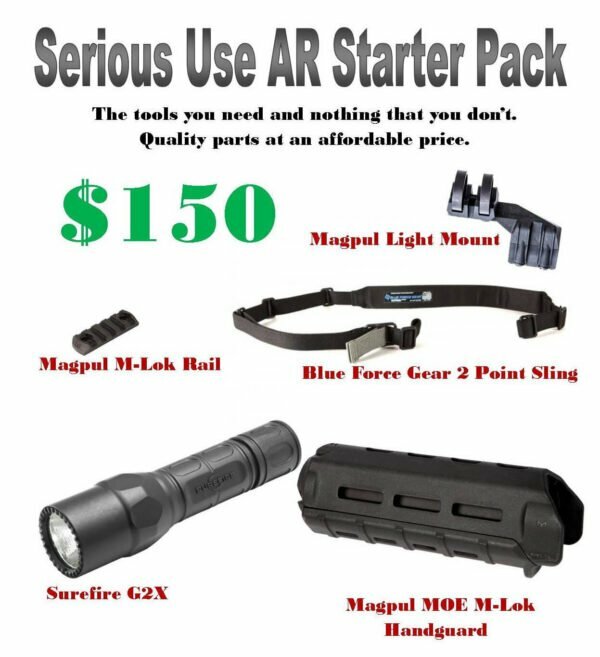 No specialty tools needed.The package includes:Surefire G2X Tactical 320 lumen lightMagpul MOE M-Lok Handguard (carbine length)Magpul Polymer Rail SectionMagpul Light Mount (select left or right side mount)Blue Force Gear 2 Point SlingThere are other accessories and parts that are great upgrades but this will be your starting point.